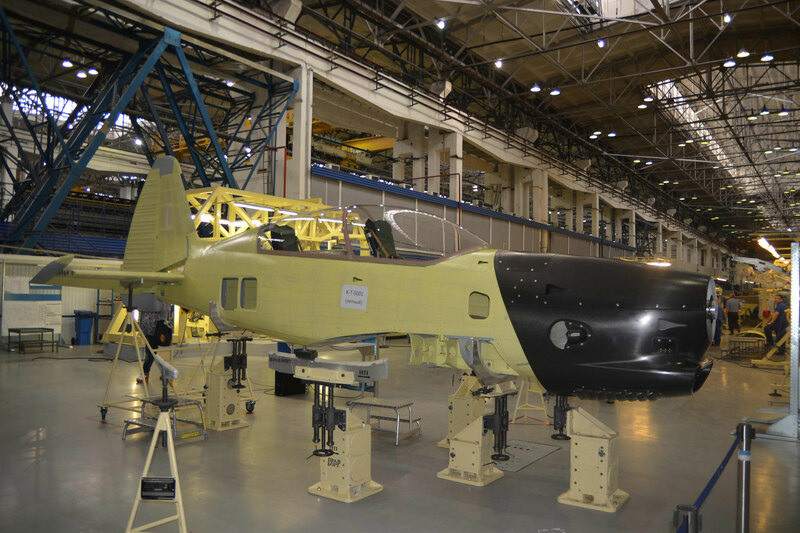 The Irkutsk Aviation plant (IAZ) of Irkut Corporation has mated the fuselage with the wing of a prototype Yakovlev Yak-152 twin-seat weaponized piston trainer. The project was revealed at the Singapore Airshow and is said to be on track for first flight by year-end. Both petrol- and diesel-powered versions are planned. The fuselage is a semi-monocoque all-metal construction except for the engine cowling, which is made of carbon-plastic. Wings are made of aluminum alloys. Yakovlev says the extensive use of metal is for simplicity of manufacturing, ensuring low costs, as well as for ruggedness and ease of repair. The prototype is powered by a diesel piston engine from Raikhlin Aircraft Engine Developments (RED) of Germany. It is available in two versions, the 300-hp A05/V6 or 500-hp A03/V12. Irkut is planning to use the latter, which provides sufficient power for the Yak-152 to fly with four underwing weapons pylons and up to 550 kg [1,100 pounds] of munitions on them. In one of the possible configurations, the inner attachment points would be occupied by rocket pods or R-73 air-to-air missiles, and the outer ones with a 50/100 kg caliber (110-220 pound) bombs. On a reconnaissance mission, the Yak-152 can take pods for aerial photography, radiation, bacteriologic and chemical warfare. The Yak-152 has G limits of +8/-6 with two pilots on board, or +9/-7 with one. The aircraft has a top speed of 310 mph (500 km/h), a range of 932 miles (1,500 km) and a landing field requirement of 1,380 ft (420 m) on a hard runway and 1,230 ft (375 m) on grass. The Yak-152 is fitted with the Zvezda SKS-94M2 escape system. Yakovlev claims that the M-14X-powered Yak-152 has a 7 percent advantage over the closest competitor in maximum range (on inner fuel it can cover 1,500 km or 810 nm) and a 15 percent advantage in the rate of climb. The design bureau suggests that the Yak-152 will appeal to sport fliers and for export. For IAZ, the Yak-152 represents a second completely digital aircraft design. The first was the Yak-130 advanced jet trainer, which is being produced at a rate of 30 units annually.